Sarah Pearson is an internationally experienced innovation practitioner and ecosystem builder, scientist, Board Director, and advocate for collaborative innovation and entrepreneurship. 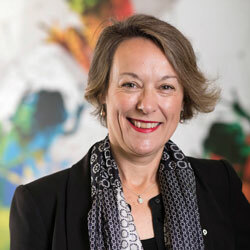 In her current role, inaugural Chief Innovation Officer at DFAT, she is responsible for leading, developing and scaling innovation practice and culture across DFAT, in neighbouring countries, and through whole of government activity. Sarah has held leadership roles in all parts of the innovation system over her career; as a tenured physics academic, global head of innovation at Cadbury, consultant at McKinsey, board Director and CEO of several companies. She has published via TV, radio, books, academic journals, magazines and newspapers, and is an inventor on eight international patents. She was awarded a DPhil from the University of Oxford in particle physics.